Photographer Megan Lorenz was taking pictures of wildlife in Canada when she was joined by an unlikely fellow snapper - a fox. 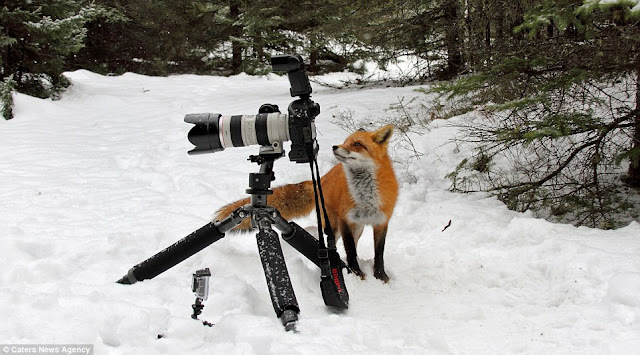 The 38-year-old was capturing the animals on film in Algonquin Provincial Park in Canada when one playful youngster decided to take over the shoot. It crept up on her and seemed to take a keen interest in her kit so Ms Lorenz, from Toronto in Ontario, Canada, decided to back away and let it investigate. 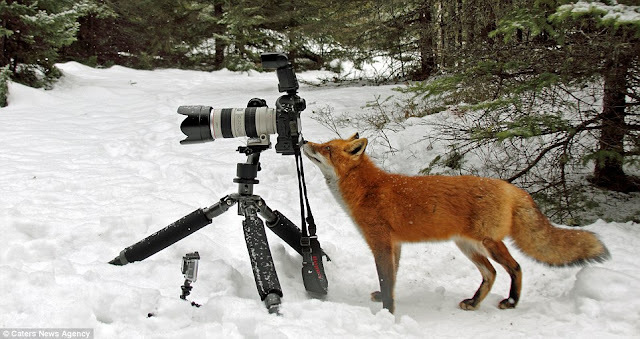 As the inquisitive fox sniffed around the tripod mounted camera it looked like he was peering through the view finder to get the best angle on his furry chums among the wintry scenes. At one point it even appeared to try and drag the camera away. 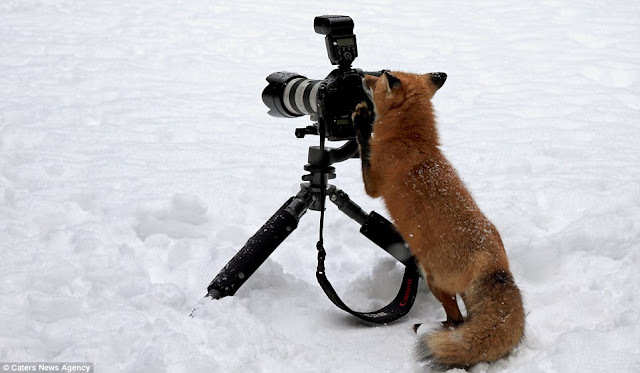 'But this is the first time it actually jumped up onto the tripod and appeared to be figuring out how to take a photograph. 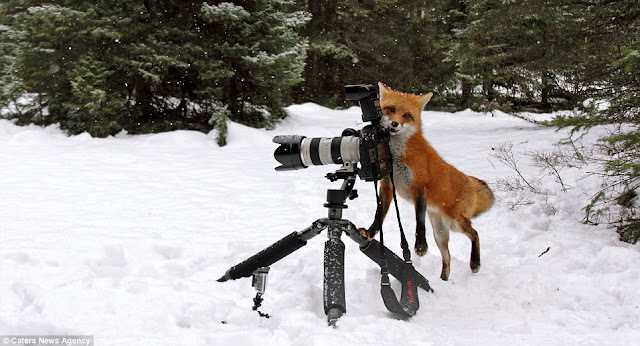 'Typically fox are very timid animals - I've spent enough time with them that they are comfortable with my presence and on this particular day they stayed with me for more than five hours. 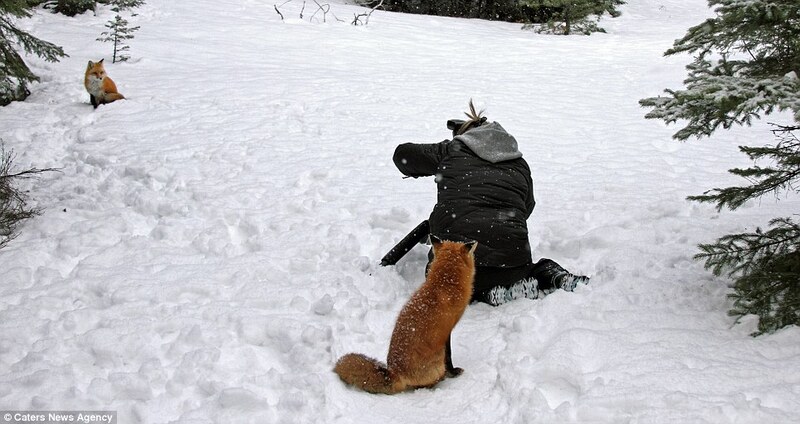 Responses to "Fox Sneaks Up On Photographer In Canadian Wilds And Tries To Steal Camera"